This Santa is very furry and soft. Sorry about the skis covering his face. His lantern is really nice. Rustic looking. Thanks to my BB again. Now this one? You really do like your Santas. Are you putting them out and about in your house or do you make a special place and display them together. I just love your new look! Thanks for the info about the X-mas countdown. I removed it from my blog as well - bummer! As excited as I get about Christmas, I love fall as well. I just may do them both, at the same time, this year! These guys get displayed all around my living room and dining room. They get put out around the first of December. I'm traveling backwards through the blogs I have missed this week. You know that I also collect Mr. Claus....this is a a nice one. 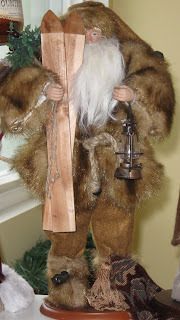 Ohhh Lori...I love this rustic Santa!!! He's really unique with all of his rustic fur parka and pants!!! Love the skiis and his lantern!!! Oooh...I really do like this Santa!!! What a beautiful addition to your collection!!! PS...read your comment...over 100 Santas??? OMG...that's fabulous! Can't wait to see them all! I would just love to see your dining room and living room when you have them all out and displayed!!! A Grizzly Adams Santa. I like it! He looks so nice and soft. I was wondering why he had covered his face - maybe feeling a little shy that day. Pretty. My mom is right there with you with the old world santas!! She should cross stitch one too, I'll tell her. Please show a piece if you do him before the holidays. Christmas xox!